Most of those installations were in the U.S., about 28 percent, analytics firm SensorTower said on Tuesday. India was a distant second at 7 percent, followed by Great Britain, Brazil, and Russia and 6, 5, and 4 percent respectively. Although quarterly installs declined from 3.3 million in the Sept. 2017 quarter to 2.3 million by the June 2018 quarter, they have since been on the rebound, climbing back to 3.3 million in the Dec. 2019 period. Current forecasts for the March quarter call for an all-time high of 3.8 million. Installs are not the same as subscriptions. By default the app offers a free three-month trial, and it's possible or even likely that many Android phone and tablet owners are simply canceling before they can be billed. In late January Apple said that it had surpassed 50 million subscribers. Given that Apple Music is best on first-party devices, which have the service natively installed and integrated with Siri, it's probable that most of those subscribers have an iPhone, iPad, or Mac. 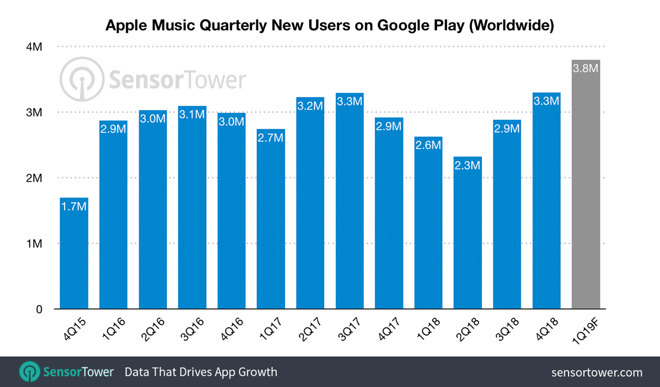 Apple has also been accused of being relatively slow to bring Apple Music updates to Android. It did however bring its streamlined Browse tab to Android on Monday, just a week after a similar iOS update was pushed. The service now also has native Chromebook support.